About Magnetic Induction Sensors｜CONTROL & SENSING | MURATEC,MURATA MACHINERY, LTD. Magnetic Induction Sensors of MURATEC is composed of the magnetic substance that moves in the conversion circuit, the first winding coil, the second winding coil, and the coil. The exchange magnetic field is generated by exciting the first winding coil by the first exchange signal that becomes a standard. Because the magnetic substance moves in the winding coil two the second arranged at the position in the exchange magnetic field, two inducement outputs corresponding to each position of two coils are obtained. The first winding coil is excited by the first exchange signal (aSinωt) from the conversion circuit. 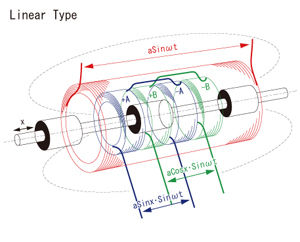 Two signals (aSinx·Sinωt/aCosx·Sinωt) with different crest value are output from the second winding coil according to the position of the magnetic substance. The aSinx·Sinωt signal is shifted by 90 degrees and it is assumed aSinx·Cosωt. It is synthesized based on another signal aCosx·Sinωt and the additional theorem, and aSin(ωt±X) is obtained. The aSin·Sinωt signal is shifted by 90 degrees and it is assumed aSinx·Cosωt. The signal obtained thus becomes a signal that becomes a standard to which the phase shifts only by X. The counter in LSI in the conversion part repeats start reset every one cycle based on the reference clock synchronizing with the first excitation signal. 0 crossing point of synthesized signal aSin(ωt±X) is detected, and the number of clock counts is output as the positional data. The miniaturization is achieved with the sensor of an absolute output. The Magnetic Induction Sensors achieved the miniaturization with absolute detection by adopting a sensor structure of a simple magnetic induction method and an original detecting scheme. Moreover, it corresponds to the length scale detection by counting the pitch of absolute. Magnetic Induction Sensors detects displacement and the position by converting mechanical displacement into the phase lag (time) between signals, and measuring for that time. As a result, an excellent repetition character is achieved. Magnetic Induction Sensors obtains a high resolution by matching the size of the mechanical displacement of the primary detecting element to two two phaseshift amount radians of the conversion part, and dividing 16 bits of the amount in the phaseshift (It is equal to division into 65536). Magnetic Induction Sensors is composed of an electromagnetic coil. The amount of the temperature drift is operated, canceled in the converter, and Magnetic Induction Sensors can be suppressed to the minimum though the temperature drift originates in the resistance change according to the temperature of the winding. It is strong under a bad environment. The primary detecting element of Magnetic Induction Sensors is strong in the vibration and the impact because it is composed only of an electromagnetic coil, and excellent also in the resistance to environments to oil, dust, and the temperature. Etc, It is also possible to set up the conversion part in influence by the environment a little, remote space. Magnetic Induction Sensors is maintenance free because of the complete contactless detection. The performance is demonstrated enough under all the environments by the achievement of the structure that the influence of dirt is not received easily. Muratec has a variety of magnetic induction sensors which corresponde to wide-range straight-line displacement from ultrashort stroke to long stroke. The best system design is achieved by matching products lightness, small size, excelling in high performance and the cost performance, and various to the condition and the purpose and selecting it. Moreover, the converter that draws out the performance of the displacement sensor according to the purpose by a flexible combination is being offered.